Before widespread use of artificial refrigeration, ice was an important part of processing, preserving, and consuming food and beverage products. Over time, an ice industry in and around Milwaukee developed to meet local industrial and residential refrigeration needs. Southeast Wisconsin proved an ideal location for the industry because its long, cold winters and extensive river and lake systems naturally produced abundant volumes of ice. Various firms formed to harvest, store, and sell this ice in the mid-to-late nineteenth century. Henry “Ice Bear” Kroeger, a Prussian immigrant, established Milwaukee’s first ice business on the Kinnickinnic River in 1844, two years prior to the city’s charter. He expanded his operations to the Menomonee River a year later and by 1863 had grown this business into a firm owning twelve icehouses. Demand for ice grew as Milwaukee and Chicago’s brewing and meatpacking industries expanded nationally in the late nineteenth century. In addition to the independent firms that developed to satisfy these needs, brewers like Blatz, Pabst, and Miller and meatpackers like Patrick Cudahy established their own ice-harvesting operations. However, Milwaukee’s rivers became severely polluted with sewage and industrial waste by the late nineteenth century. In response, the city’s ice businesses pursued cleaner water sources. Expanding railroad networks allowed the industry to harvest inland lakes, outside of the city and even the county. 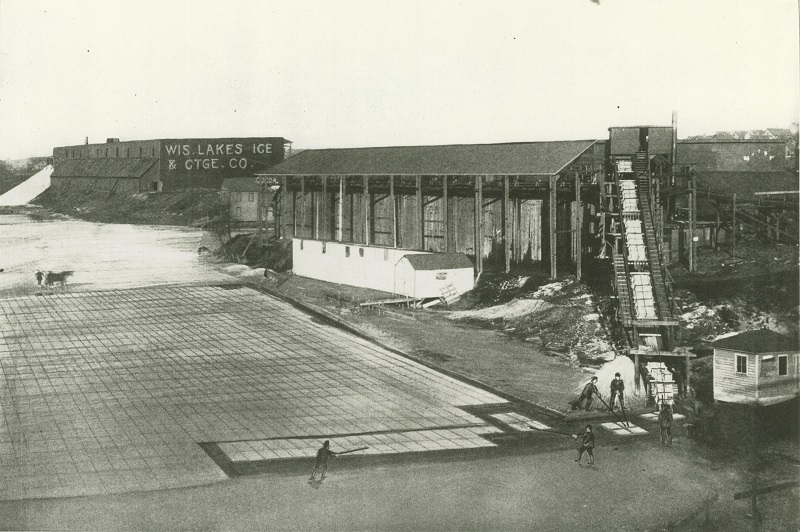 Pewaukee Lake had an especially thriving ice industry from the 1870s to the 1920s as major firms operated ice houses there. Milwaukee’s ice companies maintained many of the methods industry pioneers had developed in New England in 1820s. 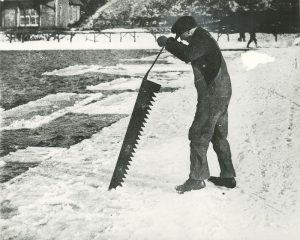 Once an ice “field” grew to a thickness of a foot or more, workers would cut a deep “checkerboard” pattern of grooves into the ice with special horse-drawn plows, which they then sawed or chiseled away into blocks. These blocks were pushed along open channels with long pikes to conveyors that moved them into large, insulated icehouses along the shore, where they were planed and stored. A single “field” could be harvested several times a winter. Ice companies shipped their product to major industries by rail, while employing “icemen” in horse-drawn carts to make deliveries to small businesses and homes. Because ice was a seasonal commodity, firms typically employed short-term workers and supplemented their interests with other ventures in the off-season, such as coal deliveries. Ice farming was a highly volatile industry. Weather fluctuations made a tremendous impact on annual receipts as colder winters boosted ice harvests and warmer winters yielded less ice. Furthermore, unclear definitions of rights to and ownership of ice fields generated intense rivalries and at times open conflict. In 1901, an “Ice War” erupted between the Pike & North Lake Ice Co. and the Wisconsin Lakes Ice & Cartage Co. over sections on the Milwaukee River. Workers from the two companies engaged in open brawls on the ice above the North Avenue Bridge as Pike & North Lake employed an icebreaker boat to repeatedly smash through Wisconsin Lakes’ large ice fields for six weeks. The two companies eventually resolved the dispute. The ice industry gradually faded away in the early twentieth century after brewers and meatpackers turned to mechanical refrigeration, and residents replaced their iceboxes with refrigerators. However, one longtime business (Hometown, Inc.) survived until it was bought out and closed in 2005. John G. Gregory, History of Milwaukee, Wisconsin, vol. 1 (Chicago and Milwaukee: S.J. Clarke Publishing, 1931), 443-444. Stanley Baron, Brewed in America: A History of Beer and Ale in the United States (Boston: Little, Brown, 1962), 233-234; John Gurda, Cream City Chronicles: Stories of Milwaukee’s Past (Madison: Wisconsin Historical Society Press, 2014), 141. Lee E. Lawrence, “The Wisconsin Ice Trade,” Wisconsin Magazine of History 48, no. 4 (Summer 1965): 259-260; Gurda, 141; Gavin Weightman, The Frozen Water Trade: A True Story (New York: Hyperion, 2003), 232-233. Lauretta Larson Wieland, The Pewaukee Ice Industry: A Tale of a Remarkable Industry, with Maps and Pictures ([Wisconsin]: n.p., 1981), 1-2, 6-14; Thomas C. Cochran, The Pabst Brewing Company: The History of an American Business (New York: New York University Press, 1948), 77; Lawrence, 261. Frank Tobias Higbie, Indispensable Outcasts: Hobo Workers and Community in the American Midwest, 1880-1930 (Urbana: University of Illinois Press, 2003), 29-30, 37; Weightman, 223; Gurda, 140; Lawrence, 261; James S. Buck, Milwaukee under the Charter, from 1847 to 1853, Inclusive, vol. 3 (Milwaukee: Syme, Swain & Co., 1884), 107; Gregory, 1: 444-446. Ibid., 264; Weightman, 233-234; Carl Swanson, “In 1901, Riverwest Residents Battled on the Frozen Milwaukee River,” Milwaukee Notebook, July 28, 2014. Gurda, 139; “Hometown Sells Packaged Ice Division; Milwaukee Plant Closes,” Milwaukee Business Journal, September 19, 2005. Lawrence, Lee E. “The Wisconsin Ice Trade.” Wisconsin Magazine of History 48, no. 4 (Summer 1965): 257-267. Wieland, Lauretta Larson. The Pewaukee Ice Industry: A Tale of a Remarkable Industry, with Maps and Pictures. [Wisconsin]: n.p., 1981.